After our dim sum brunch, we went to Tong Kee which was just a block away to get some egg tarts. Did I mention what a glutton I am? :p I refrained from ordering egg tarts from Kam Lun Tai as I already had my eyes on these gems. I got 6 tarts (RM1.20 each) to go. rif and I had one each and I gave the rest to my family. 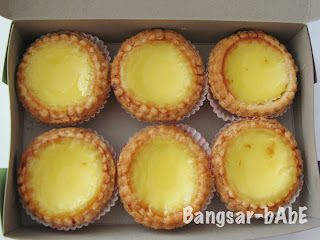 Hey, i'm searching for nice egg tart in malaysia… can i know where can i get these? 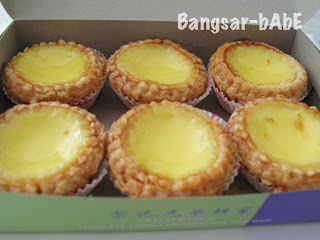 I am actually eating my Tong Kee's Egg Tart while reading ur review.. I had the one from Pudu (which I heard the HQ of all). This is no doubt the BEST egg tart in Malaysia.. Since visiting Tai Cheung in HK Central, I somehow missed the fluffiness and the creaminess of their specialty back home. And Tong Kee's version was the closest I could find, if not better. Err.. they had their butter version at RM 1.40, but I think the RM1.20 one is the lardy laced pastry. Of coz, the flakiness is all due to pork lard..